The fall colours have been spectacular this year. I am told that the brightest autumn colours occur when dry sunny days are followed by cool, dry nights. We have, indeed, enjoyed wonderful weather this fall. Right up until this week it has been sunny and dry; perfect weather for long walks on Mount Royal and for wandering around Montreal’s markets admiring the bounty of this year’s harvest which included, amazingly enough, beef steak field tomatoes right up until Thanksgiving. Unheard of. Now, approaching the end of October, the later fall offerings reflect the cooler nights. The hardy carrots, onions and cabbages are still around, joined by sweet potatoes, all manner of squash and, of course, pumpkins. Pumpkins are everywhere; this is their month. For many of us, it’s the only time that pumpkins cross our paths. The only pumpkin we eat is in a pie at Thanksgiving and the only pumpkin we buy is to carve, once a year, on Halloween. That level of neglect does not give pumpkin its due. 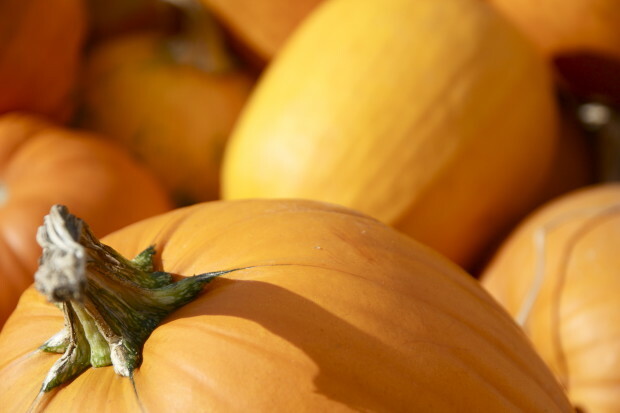 The pumpkin is more than simply a decorative gourd; it’s a nutritional superstar. It’s packed with nutrients including potassium, magnesium and vitamins C and E along with the disease-fighting cartenoids alpha- and beta-carotene. And it’s high in fibre to boot. You’ll find similar properties in carrots, butternut squash, sweet potatoes and orange bell peppers. You’ll also find a nutritional punch in pumpkin seeds, which are rich in vitamin E, iron, magnesium, potassium and zinc and a great plant-based source of omega-3 fatty acids. So while you admire the beauty of the fall markets, think about how to incorporate pumpkin into your diet all year round. 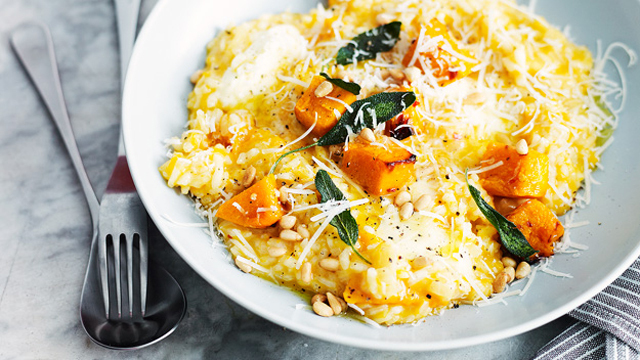 One of my favorite ways to use pumpkin throughout the year is in risotto. Here’s a recipe to get you started. Don’t worry, it’s not an exact science and you can play with the flavours, but I do love the addition of sage, which is something I always do — along with the pine nuts. Yum. You can make this dish with lovely fresh pumpkin — now — or with good quality canned pumpkin, which is available throughout the year. And, of course, you can always garnish it with pumpkin seeds. Seasoned and roasted they’re crunchy, buttery and delicious. 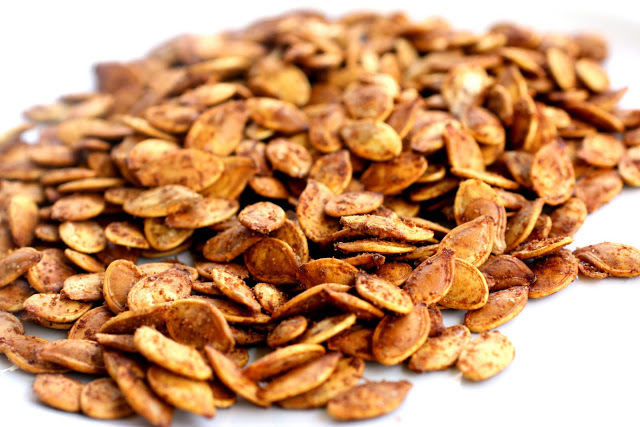 Try this delicious recipe for roasted pumpkin seeds. Or, using recommended cooking times, season them with anything you like. For example, do something classic with olive oil and salt and pepper, or something a little spicier using pepper, chilli, smoked paprika or garam masalsa. Or go for barbeque flavour with brown sugar, chipotle and ground cumin, or something sweet, tossing the toasted seeds with cinnamon and sugar. So this year, when you go out to purchase the perfect pumpkin for your Halloween jack-o-lantern, let it inspire you to think about all the ways that you can honour this powerhouse of a fruit (yes, it’s a fruit, related to the melon — not a vegetable). And that brings me to the ubiquitous Halloween pumpkin that decorates the stoop for trick-or-treaters. While we love the classic jack-o-lantern with the triangle eyes and the big toothy grin, we’ve pulled together a few different techniques to help inspire you when you execute your own creation, if you’re looking for something a little different. When you remove the guts and prepare your pumpkin for carving, don’t forget to save the seeds for roasting. It has become quite popular in the last few years to forgo a knife and use power tools — notably a drill — to decorate pumpkins. If you’ve never used a drill to decorate your pumpkin before, here’s a great tutorial to get you started. It’ll help you create designs from something simple and graphic yet really effective like these three pumpkins that spell “BOO” to something a little more involved, complicated and artistic such as filigree patterns. The tutorial covers steps from cleaning and prepping the pumpkin to marking out the design and selecting the right size drill bits to achieve the desired effect. It includes some important tips, like be sure to make the holes large enough that the light radiates out and sufficient air circulates to keep the flame alive inside the pumpkin. Another departure from a traditional carved pumpkin is to use a stencil to help create an elaborate design. There are lots of stencils available for free on line, from the very tasteful, courtesy of Martha Stewart, to sites like Zombie Pumpkins, which has a huge selection of intricate zombie-related and other classic Halloween-themed stencils. Once you find a stencil that you like, tape it to the side of the pumpkin. Using a nail, or another transfer tool, start punching holes along the lines designed on the stencil. Punch deep enough through the pumpkin so when it’s time to saw, the lines will make it easier to cut through. Once the whole design is punched out, cut out the pieces of the design using a small carving saw. Some people are so talented that they can create true artistic masterpieces without the help of templates. 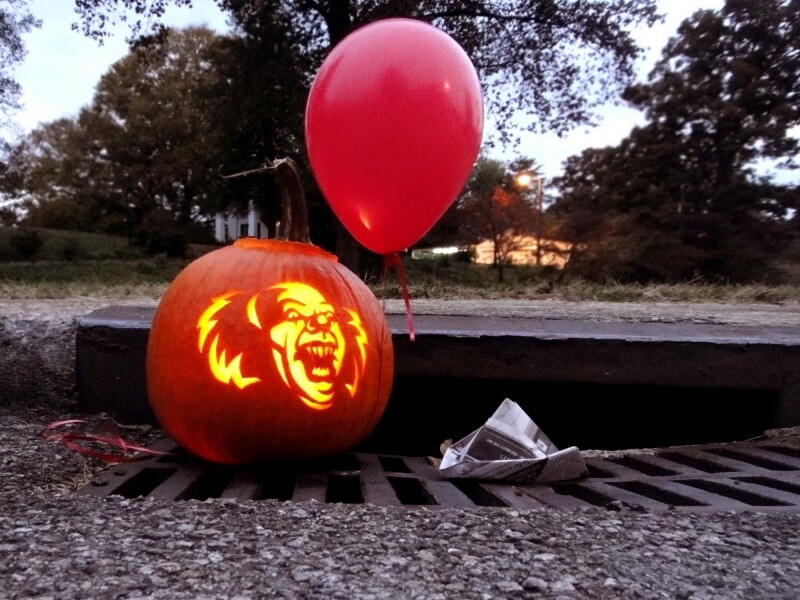 Maniac Pumpkin Carvers in Brooklyn is home to some of these talented folk. They’re real pros, carving more than 400 unique and elaborate pumpkins every Halloween. 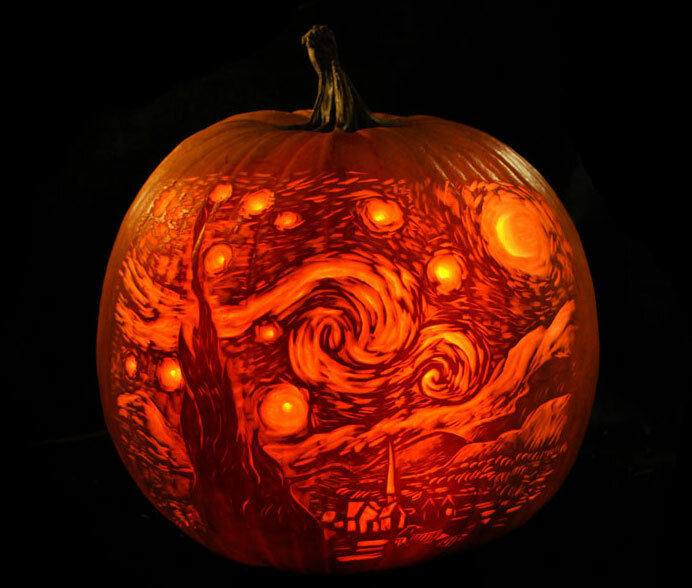 In an interview with mental_floss, they shared some useful tips for beginners and experts alike, interested in creating unique and artistic pumpkins. For example, they propose cutting your hole in the back of the pumpkin to keep the stem in tact, rather than the top or the bottom, and they suggest using a wide range of tools from paring knives to lemon zesters, rasps, exacto knives and lino cutting tools. If you don’t want to get your hands dirty, you can achieve some stunning effects without carving. There are several resources on line that will help inspire you to find original and beautiful decorating ideas that don’t involve cleaning and carving pumpkins. 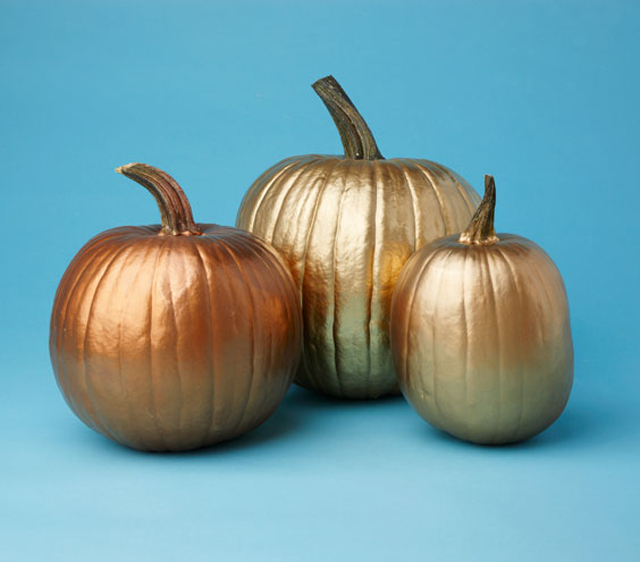 They won’t work to light your porch for trick-or-treaters, but even the simplest designs can be visually stunning like these “heavy metal” pumpkins. They’re sophisticated and elegant, yet couldn’t be easier to produce. All you need is some metallic spray paint, a damp rag (to clean the pumpkin) and some newspaper to sit the pumpkins on. Make sure you work in a well ventilated space. Spray the pumpkins. Two coats work best. Then let them dry for at least 24 hours. 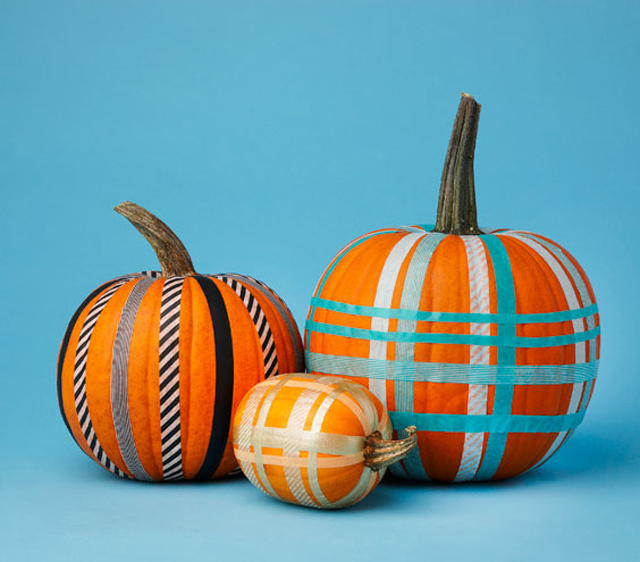 You could also choose to something a little more design-oriented like these pumpkins designed with a washi tape plaid pattern. I love washi tape. It’s available in so many patterns and colours, that decorating with it really offers endless possibilities. To create a plaid effect, use a dry erase marker to map out your design. Then mark it out with tape to the pumpkin’s surface. Try using longer strips because piecing together too many short strips will look sloppy. Begin at the stem and run your tape down the side of the pumpkin, erasing the markings as you adhere the strips to the surface. After the vertical stripes have been made, apply tape around the circumference of the pumpkin to complete your pattern. However you decide to decorate your pumpkin, it will all be over on November 1. It seems like such a shame that the morning after Halloween when all your hard work gets tossed out with the garbage. It appears as though lots of people feel that way, so in some cities, communities get together to showcase pumpkins from the neighbourhood in a Pumpkin Parade on November 1st. Have a look and see if there’s anything going on where you live. 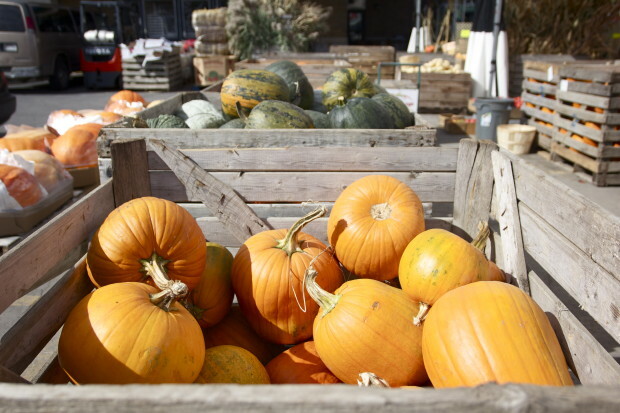 In Montreal you can find Pumpkin Parades in Montreal West at Strathern Park and in Outremont at Pratt Park. What’s your favourite way to get pumpkin into your diet throughout the year? 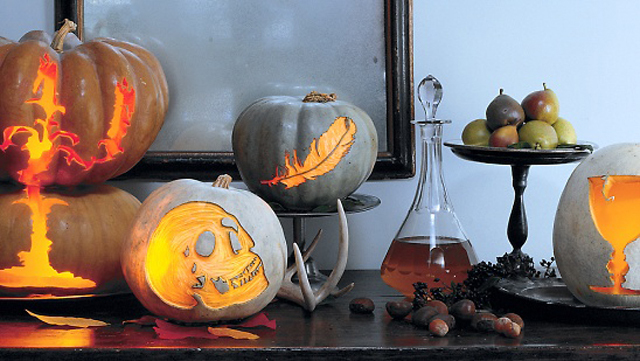 How will you decorate your pumpkin this Halloween? Fall is here. In Montreal, it’s time to bring in the plants and batten down the hatches for another winter. After a summer enjoyed in the great outdoors, once we seal up our homes for another winter, I wonder how many of us turn our thoughts to indoor air quality. In fact, indoor air pollutants can be significantly higher than outdoor air pollutants. Our homes and the stuff we have in them can contain a cocktail of hazardous substances such as formaldehyde (found in MDF, carpets, upholstery) and volatile organic compounds (VOCs) off-gassed from carpets, upholstery, paints, insulation, plastics and countless other common products. Green plants come in handy here. They absorb toxins, removing VOCs from the ambient air, and they actually improve air quality through photosynthesizing — that is, absorbing carbon dioxide and releasing energy rich oxygen. 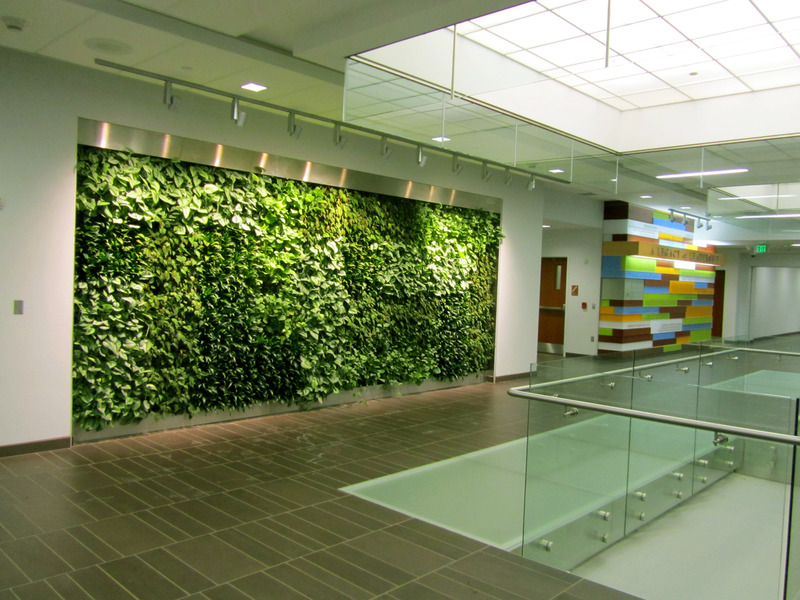 An effort to capture these health benefits is propelling the movement in corporate headquarters, arts institutions, universities and public spaces to incorporate into their interior architecture permanent installations of plants — or living walls. 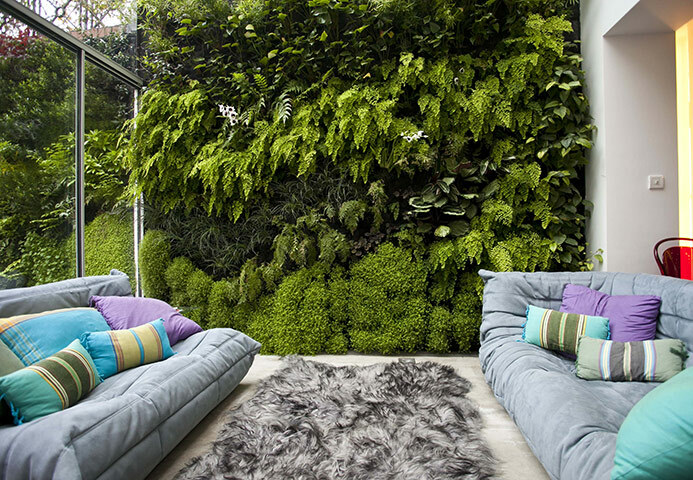 Living walls are covered by plants, which do not root in the ground but in soil or mats suspended on the wall itself. In addition to being visually stunning and delivering physical benefits, living walls provide psychological health benefits by inserting nature into human (and often corporate) landscapes. Most living walls require a significant investment, a relatively sophisticated infrastructure and considerable maintenance commitments that can be met in institutional settings. But there is no reason that the infrastructure can’t be transferred to people’s homes, as long as they have the means and ability to pay for and care for the undertaking. 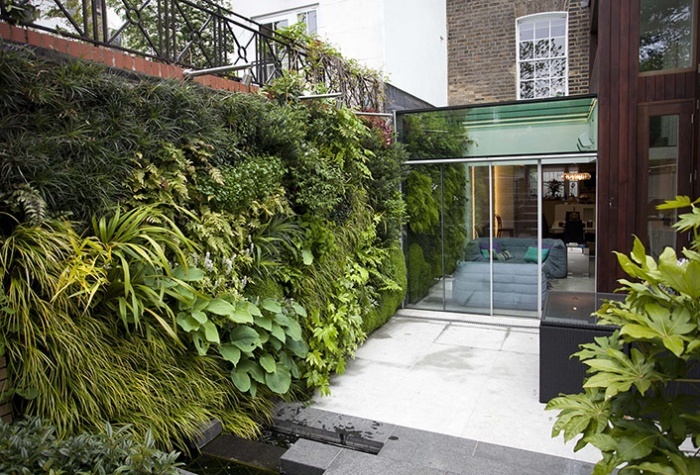 Take, for example, this fabulous creation by garden designer Daniel Bell who created a living wall that runs inside and outside a house in north London in the UK. This wall is made from two layers of capillary matting (made from recycled clothes) with a waterproof plastic backing. Slits were cut in the outer felt, plants were inserted, and the opening was then stapled to anchor the plant. This system allowed the designer to create different-sized pockets to suit different plants. The innovative design coupled with clever plant choices resulted in an absolutely spectacular living wall masterpiece. 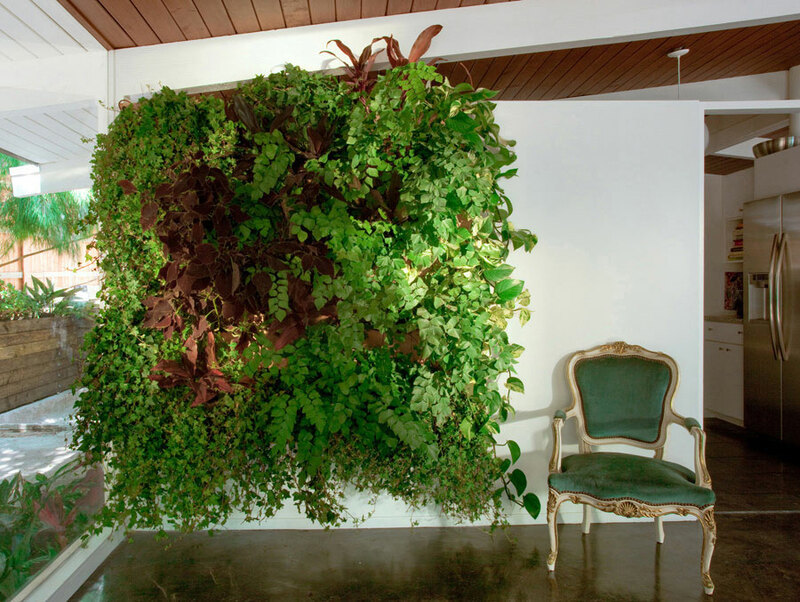 When I opened Galerie CO in 2008 I budgeted out installing a living wall in the boutique. At the time it represented too large an investment when there were so many other things that needed to be done. 1. Colourful and petite, Thelermont Hupton’s delightful ‘off the wall’ ceramic wall pots are ideal for small bursts of interior greenery in the kitchen, living room, home office or bathroom. With invisible fixtures these simple pots let your plants nestle on the wall creating discrete and artful interior ‘gardens’. 2. A larger option is available from Wooly pockets. Made from 100% recycled post-consumer PET plastic bottles, these planters hang on the wall. They are easy to install, simple to use and modular, allowing you to create a custom-sized living wall to fit your space. 3. If you don’t have the space or the inclination for a living wall, Boskke’s innovative sky planters allow you to suspend plants upside down from the ceiling. They are striking on their own, but really pack a surreal visual punch when the three different sizes are displayed at various heights with an array of different plants. Boskke provides some guidance on the types of plants that love to be raised upside down. 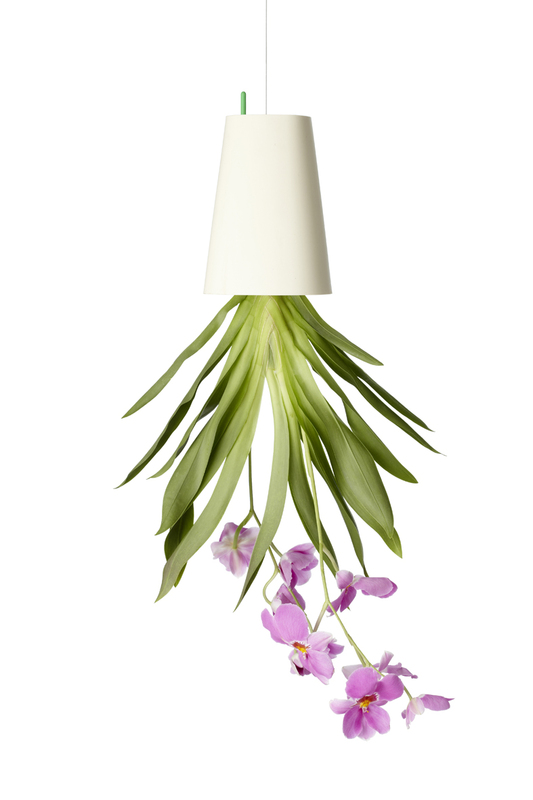 In our experience, orchids do especially well in the skyplanters. In nature they grow clinging to tree branches, their roots firmly attached to the bark of a tree, which explains why they are so content upside down in the sky planters. 4. L.A.’s Sheleterblack has created beautifully simple and contemporary wooden wall mountable planter frames. The Garden State boxes are available with contrast detail on half of the perimeter in black, neon pink and neon yellow. 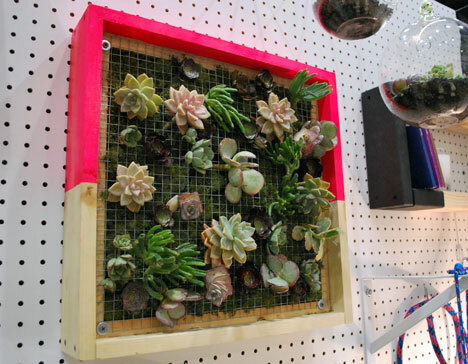 They are designed especially for succulents, which are secured through a wire mesh. So, as the air cools in the evenings and the threat of frost approaches, when you bring in your patio plants think about creating your own, affordable, living wall on a smaller scale. We’d love to see how you create green spaces inside you own home. Send us your photos on twitter or instagram @GalerieCO or tag yourself as a #COclient to be featured.